I am sure that the receipt of this mail will be of utmost blessing to you.However sorry to marvel you a bit and take some of your time in going through this unpredicted letter from me. I am Miss Alice, the only Daughter of my late parents Mr.and Mrs.Jean Toure, My father was a highly reputable busnness magnate who operated in the capital of Ivory coast during his days.I'm a deaf girl. It is sad to say that my father passed away mysteriously in France during one of his business trips abroad in the year 12th.Febuary 2010.Though his sudden death was linked or rather suspected to have been masterminded by an uncle of his who travelled with him at that time. But God knows the truth! My mother died when I was just 6 years old,and since then my father took me so special. Before his death on Febuary 12th 2010, he called his lawyer who accompanied him to the hospital and told him that he has the sum of Seven million,Five hundred thousand United State Dollars. (USD$7.500,000 Million) left in a Security Company here in Abidjan, that he used my name as the only daughter for his next of kin to deposit the funds. He also explained to me that it was because of this wealth that he was posisoned. I am just 22 years old and a university undergraduate and really don't know what to do. Now I want an account overseas where I can transfer this funds and after the transaction i will come and live with you as a partner,to complete my education and invest in your country. I'm ready to do anything of your choice. 3.What percentage of the total amount in question will be good for you after the money is in your control while i come over and finalize my education? Please,Consider this and get back to me as soon as possible Immedaitely i confirmed you willingness then i will send to you my picture.And i will need your own pictures as well. Thanks very much for your response and the contents therein. I felt very much happy that i connect with you. Actually we know ourselvs newly through mail but believe me that after the delivering of the consignment to your control then I will come over to your country for an investment and to continue my education as i explianed in my previous message i sent to you. I got your email contact through my private search looking for someone to assist me. I am a genuine girl and i want you to trust me as i do to you. I really appreciate the content of your mail. I'm sure that you will never regret knowing me ok,trust me as i do to you so that accomplish this goal.Are you really trustworthy? Because i'm in a critical situation and i need your sincere assistant. Please read my previouse message well for your understanding because i explain everything in details.Please i will like you understand with me that the consignment box is all that i have,and i cannot just forget it because it is my birth right,and if i left it here in the security company,and come to stay with you,my wicked wicked uncle might do anything possible to claim it and if something like this happens,my late father's spirit will not be happy with me.I accepted to live with you as my life partner if you assist me to retrieve this consignment out of the security company and i promisse to be under your control and will do whatever you wished. My late father loves me so much so his death brought sorrow to my life. It's just like a part of me has been taken away and I have cried my heart out. I only have to look upon the good Lord to thrive on. You know its not easy though. Its a bit uncomfortable losing loved ones, The pain I must say is excruciating. My situation is better imagined. However You will have to help me in bringing this consignment box out of the storage company where the deposite was made by my late father and to invest this fund in your country in a good business that we will be less tax and yeild more benefits in the nearest future, that is the more reason why I contacted you. You do not need to come down here because i will join you there as soon as you recieve the consignment there under your control. I feel alone in the world. All left out. I do pray to God to be with me and keep me alive. The consignment is all I got and I have told you to be honest with me as I will by the grace of God conclude this delivering of the consignment box with you. I do not have any close relative here only my wicked uncle who is treatening to kill me so that he will claim all my late father's wealths. Right now i am not living with him because his characters became unfair to me and i consider my life as unsafe staying with him, I explained my situation to our church pastor and he ask me to come and stay with him and his family while i quickly look for a trust person to help me move out of my country here that is why i told you that you do not need to come down here. I do not have brother or sister because my lovely Mum died when i was six years old and according to the love my late father have for her he refuse to re-marry again. I will tell you more when i join you there in your country but please do comply with me. I assure you that by the time you see me and the money you will appreciate me better. The brutal murder of my father is still very fresh in my memory for me. I am 22 years old deaf girl, The money is ($7.5 Million) deposited in safe deposit in a Storage Company. Please don't cheat on me after you retrieve the consignment in your control because the consignment is all i hope for settle down my life overthere. Note too that i shall depend on your discretion in the areas of investment while i concentrate on my study. Please this is important. I have in mind to establish a rewarding investment and good relationship with you. Concerning the money, I am prepared to offer you a reasonable percentage of the total sum proceeds if you are ready to assist me sincerly. If you help me get this consignment fund out. I will appreciate it and remain greatful to you. But before any further procceedure i will need your information's such as home and office address, phone and fax number, your full name and pictures just for more trust and confidence that you will not mislead or betray me after you recieve the consignment in your home, on the reciept of the above required information i will give you more details on how to get the consignment deliver to your control and how i will join you in your country,By giving you the contact of my late father's lawyer and the contact of the storage trust and finance company for you to contact them and retrieve the consignment from them. I attached my pictures. Here is my own address information. 01 bp 124 Abidjan 01 Cote D'Ivoire 2 avenue 35 koumassi. My Country is Cote D'Iviore or Ivory Coast. My State is Abidjan. My City is Koumassi. I am eagarly waiting for the above required informations before any further procceedures. Thanks very much for your response. I am happy for your understanding and willingness to stand for me in this difficult moment I’m passing through in my life, Thank you and God bless you for me. I trust you now and pray that you remain honest to me after you received the consignment box in your control. I will join you immediately after the company delivers the consignment box to you because our church pastor has been assisting me for my student travelling visa to enable me join you over there in your country after you receive the money.Please the fund is already deposited in a security company and not a bank.Therefore i want you to feel free because everything will work out perfectlyby the grace of God.I attached to you in the message,the deposit certificate of the consignment. 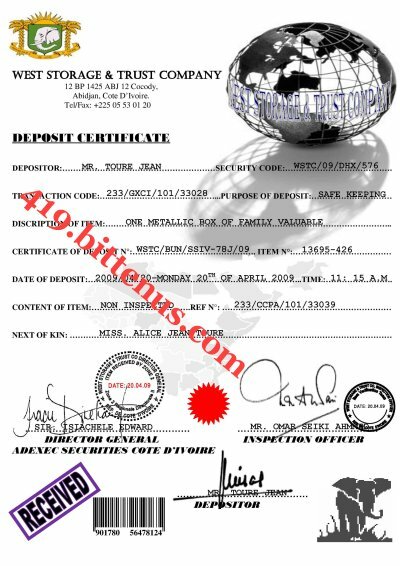 Here is the contact of the lawyer I told you about through my previous message so that you will email and call him, He will assist us to get all the legal documents in your name to allow the company to deliver the consignment intact to your home through their diplomatic courier service. Phone: +225 66 86 54 40. Address: 06 bp 960 Abidjan 06 Cote d'Ivoire. I also gave him your data information for his confirmation when you contact him, So feel free to contact him now because he will be expecting to hear from you. I will give you the full details so that you will not make mistakes, My late father packaged the money in a consignment box and deposited the consignment box without disclosed the contents to the staff of the storage company for security of the money and i want you to still maintain the upper most secrecy until you receive the consignment under your control. When you are contacting the Storage Company do not mention anything in regard of the contents of the consignment. He registered the consignment box as a family valuable property and the company agreed to deliver the consignment intact to your home through their diplomatic courier means. Here is the full contact of the Storage Company. WEST STORAGE AND TRUST COMPANY. 12 BP 1425 ABJ 12 COCODY. Tel: +225 55 36 00 18. Contact Person: Sir Nelson Aka. I want you to feel free tocontact the lawyer because everything is legal and risk free, I trust you now and still want you to remain honest to me after you receive the money under your control, Please do not betray the trust I have in you.